Chronic Pain Syndrome, fibromyalgia, and multiple sclerosis (MS) can drain your energy and inflict long-term pain. Read more about these conditions and how we use advanced medical imaging to develop your treatment and verify its effectiveness. In chronic pain syndrome, your pain does more than just hurt. It persists for months, and sometimes years. Back pain, neck pain, and headaches are the most common types, but chronic pain can occur anywhere in the body. Its sufferers often experience chronic fatigue, a disorder that causes extreme tiredness for months or years at a time. In addition to chronic pain and fatigue, fibromyalgia sufferers may experience sensations like burning, tingling, and numbness. Their discomfort can keep them up at night. Even mild exertion can aggravate the pain and fatigue, forcing many fibromyalgia sufferers to avoid their passions and stay inactive. They may also experience digestive disorders, headaches, and memory problems. Understandably, these issues can contribute to depression. Multiple sclerosis (MS) is another neurological disorder with symptoms nearly identical to fibromyalgia (see above), along with diminished balance, coordination, and muscular strength. These problems can seriously interfere with basic daily activities. Some sufferers also experience visual problems. The medical community still does not know the exact cause of these disorders. However, recent studies and clinical trials show that people often develop them within one or two decades after experiencing physical trauma. The most common traumas preceding these disorders were head and neck injuries from car accidents, slips, falls, and work-related injuries. These head and neck injuries can cause spinal misalignment where the head and neck meet, compressing the brainstem, spinal cord, or nerves. 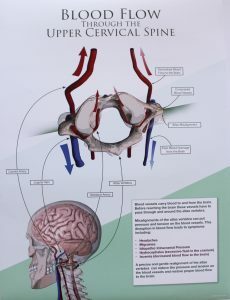 This compression causes irritation to the nervous system and can interfere with the proper flow of blood and cerebrospinal fluid (CSF) in and around the brain and spinal cord. If blood and CSF cannot flow correctly, the nervous system can become imbalanced and dysfunctional. 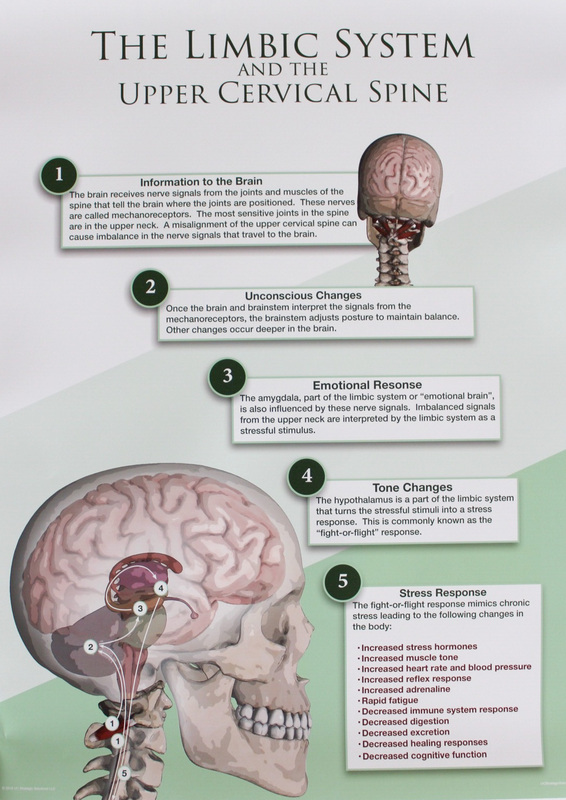 The result can be messages that are not being properly sent between the brain and the body. When indicated, Dr. Dutson can order a special, weight-bearing MRI of the craniocervical (head and neck) junction. This high-tech imaging can often confirm this condition when it is present. 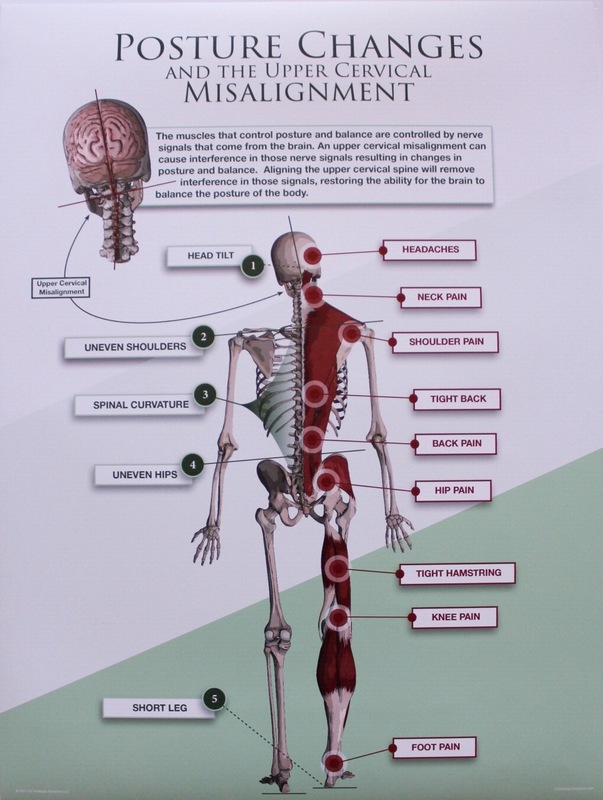 This critical information allows our care to focus on the root cause instead of chasing symptoms around the body. 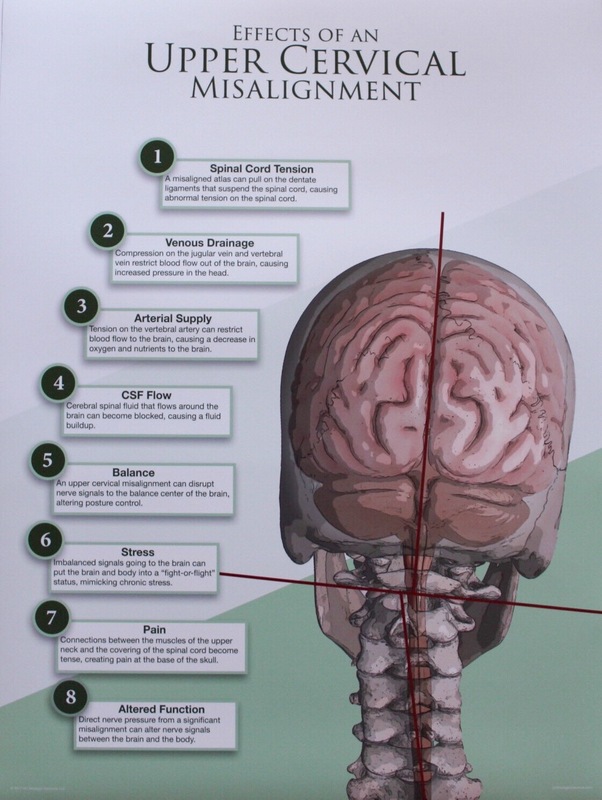 Our treatment approach can help restore neurological balance and function as well as improve the flow of blood and CSF. Thrive Head & Spinal Care offers upper cervical chiropractic care, which corrects the upper-neck spinal misalignments. 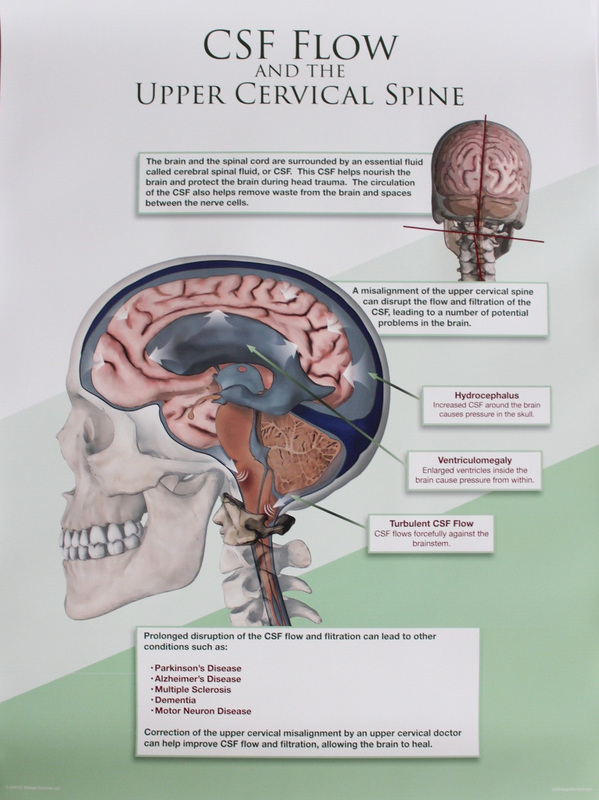 Post-correction MRIs have documented that upper cervical correction improves blood and CSF flow into and out of the brain. Many people with chronic pain syndrome, fibromyalgia, and MS report symptom relief after this treatment. 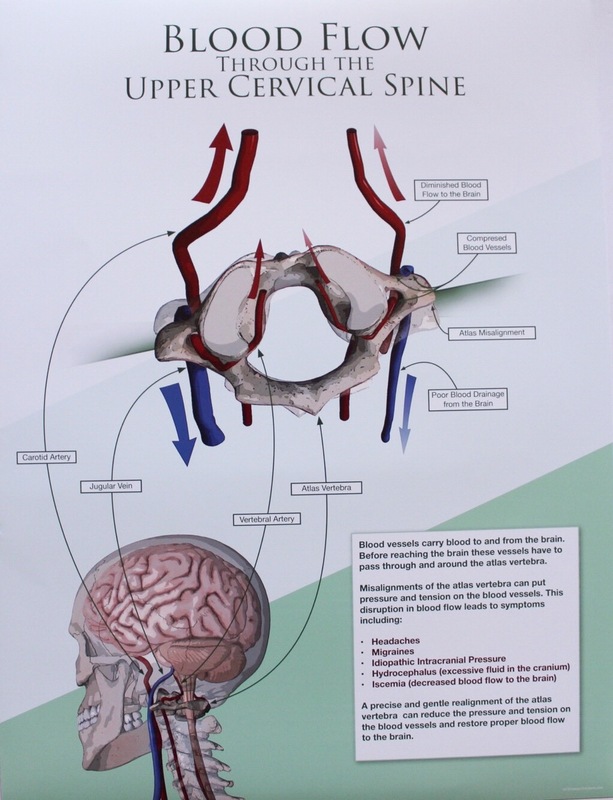 Upper cervical chiropractic care is gentle and precise. It involves no twisting, cracking, or popping of the neck. Instead, we apply math, physics, and engineering principles to determine the correction you need to restore your normal position and function. We use pre- and post-correction tests, including MRIs when appropriate, to ensure that your nervous system function has improved and your body has the best opportunity to heal. Don’t lose another hour of life to neurological pain, fatigue, and other debilitating symptoms. Our mission is to provide the highest quality of upper cervical care with the fewest number of follow-up visits. Dr. Dutson sees every patient as a person, not as a condition. He wants to help you enjoy your life to the fullest and thrive. Schedule your consultation today.